Herring Girl £1,395- 40cm x 35cm, glass and unglazed ceramic tesserae. 'Herring Girl' was created for BAMM North's 'Lost Words' mosaic exhibition opening in February 2019 at RHS Harlow Carr, Harrogate. 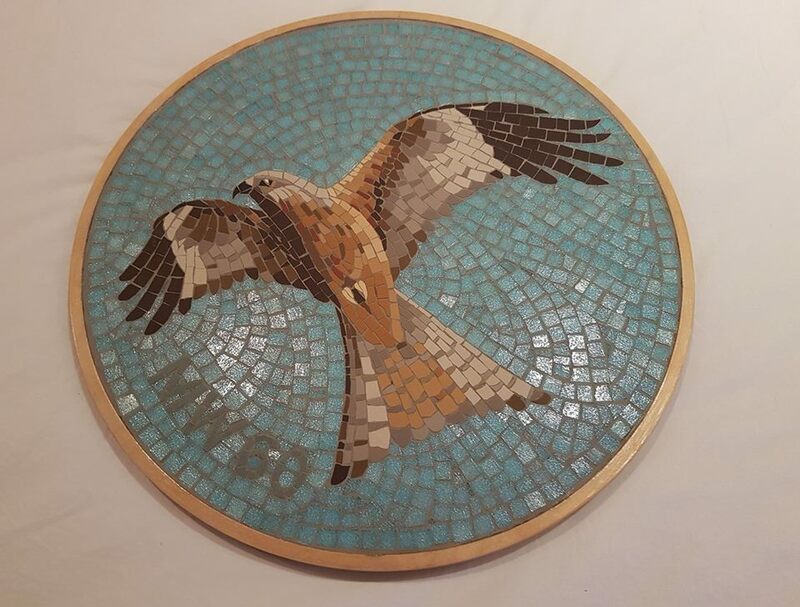 This mosaic was inspired by the Scottish herring girls who followed the shoals of herring down the coast, and worked long hours bent over a trough full of fish, gutting 50 FISH IN ONE MINUTE and layering them in barrels with salt. I watched this woman on a 1920s Pathe news report, and couldn't actually see what she was doing with her hands, they were just a blur of movement. The herring boats had deep red sails and were so many that they spanned Scarborough's horizon like a line of fire. 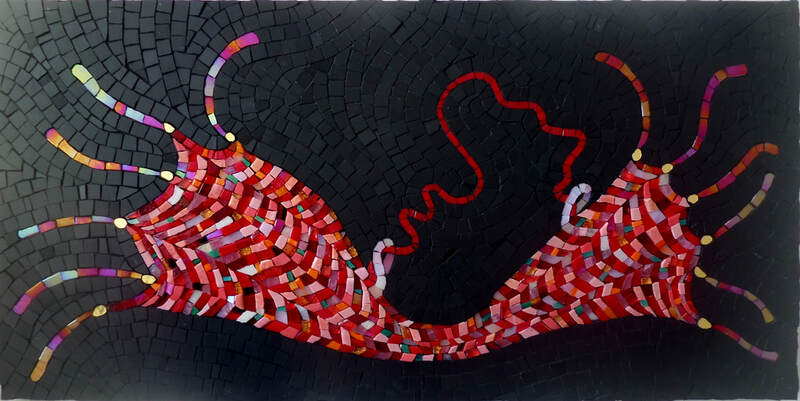 'Scarf for my Sister', gold, glass tesserae, mirror glass, glitter glass, stained glass, dichroic glass and black unglazed ceramic tesserae, MDF backing board 60cm x 30cm. My sister sent me a warm winter scarf one year when I lived on the Greek island of Lesvos. Old Margaret 'D'- 1920's agricultural worker who lived in Feltham Middlesex. Margaret smoked a pipe, and you can see her ipe tucked into the side of the basket of plums. 120cm x 45cm created for the exterior wall of Belvedere House in Feltham. Glass and unglazed ceramic tesserae, ​clay pipe taken from the Thames foreshore. 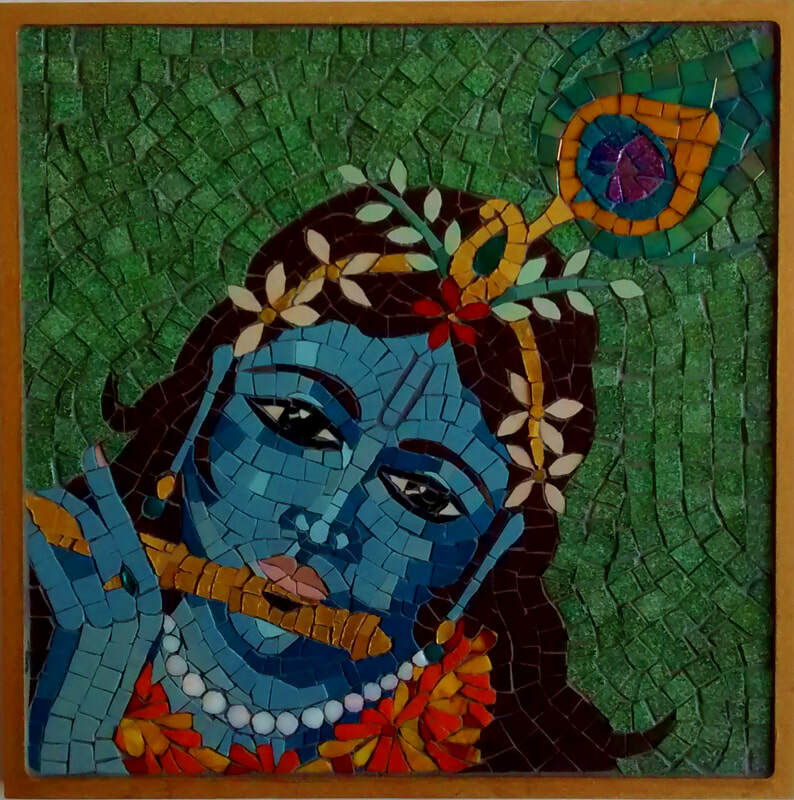 Krishna, 30cm x 30cm, unglazed ceramic and glass tesserae, glass beads (earings), gold.